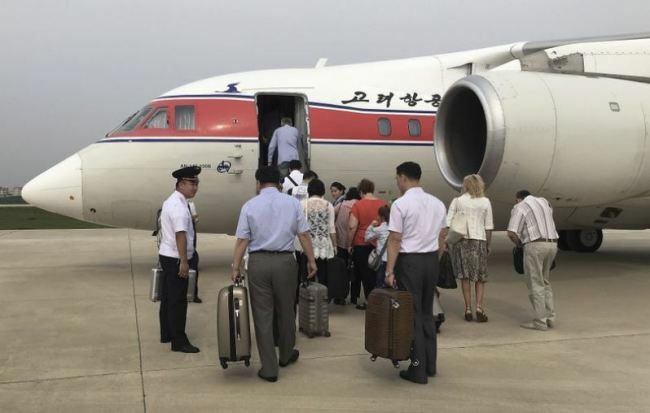 BEIJING -- North Korea's flag carrier, Air Koryo, has temporarily increased its Pyongyang-bound flights from Beijing, ahead of the North's 70th founding anniversary on Sept. 9, sources in the Chinese capital said Tuesday. They said Air Koryo will offer six additional flights from Beijing to Pyongyang, the North's capital, from Thursday to Saturday to accommodate foreign visitors planning to celebrate the landmark anniversary. On Thursday, Air Koryo will operate three extra flights to Pyongyang at noon, 4 p.m. and 7 p.m., along with its 2 p.m. regular flight. On Friday, a further flight is scheduled to leave Beijing at 7:50 a.m., with two more at 11:30 a.m. and 7 p.m. Considering the temporary increase in the number of flights bound for Pyongyang, this year's Sept. 9 anniversary event is expected to be the largest ever, the sources said. In fact, Air Koryo's check-in desk at Beijing's international airport was crowded Tuesday with more than twice as many passengers as usual, including foreigners. A long line formed at the Air Koryo check-in desk about two hours before boarding time. "North Korea appears to have increased its Pyongyang-bound flights in preparation for a spike in foreign visitors, including pro-North residents in Japan and foreign reporters wanting to attend the Sept. 9 anniversary events," a source in Beijing said.